Take the historical tour and receive small discounts at selected merchants. Taste of Sitka Sea Walk Tour is a historical tour of downtown Sitka, Alaska focused on historical and current points of interest. Bob Purvis, a retired educator, has been involved with the tour industry in Sitka since 1997. He has created an historical tour along historic Lincoln Street where visitors can meet local merchants and experience locally made products. Tour guest also will learn of the Tlingit and Russian history of Sitka. Sitka is a small community on the West side of Baranof Island in Southeast Alaska with a rich cultural history dating back to time immemorial. 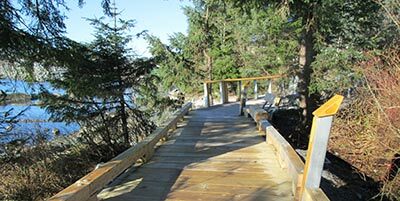 As a longtime resident of Southeast Alaska and Sitka, Bob enjoys sharing the uniqueness of this small community with visitors. The two hour plus historical tour begins at Castle Hill and will provide visitors an opportunity to walk along Lincoln Street, stopping for historical highlights and unique locally made products. Highlights include Castle Hill, site of the transfer of Alaska from Russia to the United States. 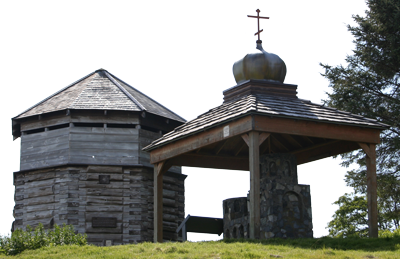 Other sites of note include St. Michael’s Cathedral, the Russian Bishop’s House and the new Sea Walk (see photo at right) with views of the historic Sheldon Jackson College, the Alaska State Museum and Sitka Sound Science Center. The tour ends at the Sitka National Historic Monument where guests can proceed on their own to visit the Park, go on to the nearby Raptor Center, or return to explore any of the previous sites. Sitka boasts a variety of excellent locally made products including Theobroma chocolate, Devil's Club soap, suave and Alaska Pure Sea Salt. Meet the artisans, learn about their process and purchase a special local made treasure to share with family and friends. A discount card is provided to each guest at the end of the tour. Join a Taste of Sitka tour and learn about Sitka’s rich history from a knowledgeable and enthusiastic guide. See the six business descriptions below for more information. The tour is less than a mile in length and is fully accessible to vision impaired and mobility impaired individuals. Cost for the 2 hour historical tour is $40 per person. For more information or to book an historical tour, call Bob at 907-738-6574 or email robert@tasteofsitka.com. WinterSong Soap Company is a small family business. Their business started in a home kitchen. They combine soap-making with traditional herbs, including local plants. Their herbal soaps, salves and bath products are simply made, cut and packaged by hand using recycled papers, locally made wooden crates and simple packaging. For more information go to wintersongsoap.com. Alaska Pure Sea Salt, owned by a local husband and wife team, produces flake style sea salt. After many kitchen experiments, they came up with a product that is now sold to some of the nation's best chefs, and to you. It comes in different flavors and products. Learn more about this product on their website: alaskapureseasalt.com. The Chocolate Moose and Sitka Flowers is a locally-owned, combined chocolate shop and flower store. It	has	a wonderful selection of gifts, plants and flowers, espresso coffee, and gourmet chocolates. For	more information, visit their website: sitka-flowers.com. Island Artists Gallery is a co-op of local Artists who have opened a store front Gallery to offer our work for you to enjoy. From scenic Alaskan Watercolor Paintings and Photography to Pottery to Jewelry and more. 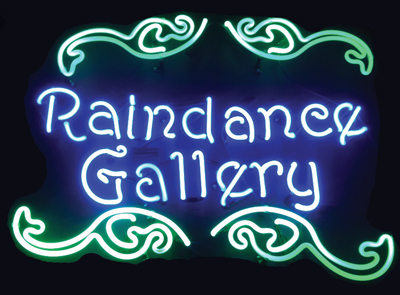 Raindance Gallery is owned by master carver, Tommy Joseph. Raindance carries a variety of art, with a focus on local talent, while showcasing his own work. 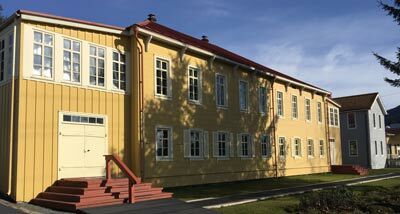 This unique gallery also has an open studio where you can see artists at work, smell the cedar, and connect with the dynamic culture in Sitka. It’s in a beautiful old recently renovated house.